TRIUMPH-1 is a fully integrated package ready for your demanding jobs, offering precise and automated performance beyond anything you have experienced so far.An elegant, rugged, light (1.7 kg, 18×18 cm), and hermetically sealed box accommodates all GNSS and Modem electronics, antennas, and up to 20 hours of rechargeable batteries and its sophisticated power management system. The close proximity of our batteries with the electronic section helps the batteries to absorb heat and function better in cold weathers. The batteries can be charged with any power supply from 10 volts to 30 volts, which includes car, ship and airplane batteries. 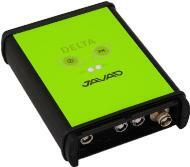 DELTA receiver is based on our TRIUMPH Technology implemented in our TRIUMPH Chip. For the first time in the GNSS history we offer up to 100 Hz RTK. 216 channels of single or dual frequency GPS, Gallileo and GLONASS in a small attractive, sturdy, and watertight box, which contains either Duo-G2, Duo-G2D, TRE-G2T, TRE-G3T, TRE-G3TAJ, or Quattro-G3D board. The on-board power supply on DELTA receiver accepts any voltage from +10 to +30 volts and delivers clean filtered voltage where needed. 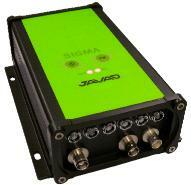 SIGMA receiver is based on our TRIUMPH Technology implemented in our TRIUMPH Chip. For the first time in the GNSS history we offer up to 100 Hz RTK. 216 channels of single or dual frequency GPS, Gallileo and GLONASS in a small attractive, sturdy, and watertight box, which contains either Duo-G2, Duo-G2D, TRE-G2T, TRE-G3T, TRE-G3TAJ, or Quattro-G3D board. The on-board power supply on SIGMA receiver accepts any voltage from +10 to +30 volts and delivers clean filtered voltage where needed. Victor is rugged, powerful, waterproof, shockproof and versatile. It meets IP 67 and Mil-Std-810F standards for drop, vibration, altitude, immersion, humidity, sand/dust, and operating temperature. Victor is pre-loaded with our Tracy field software. When turned on, Victor automatically connects to TRIUMPH-1 or TRIUMPH-4X via its internal Bluetooth and guides you through field operations. It manages the GNSS receiver and modem operations automatically.